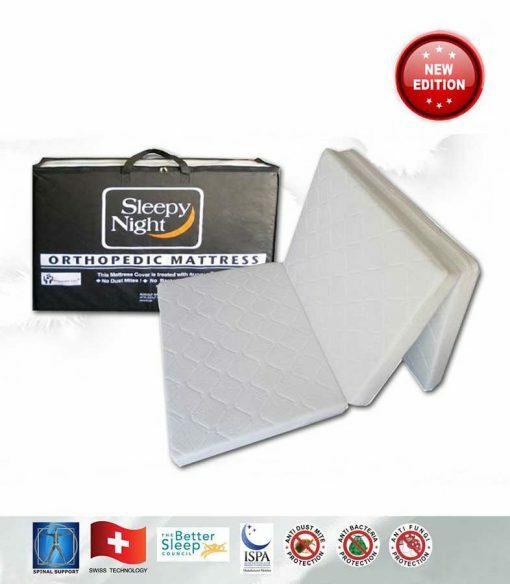 This Sleepy Night 3-fold orthopaedic mattress is extremely useful for small living space as it can be folded and kept in confined spaces. Comes in Single size with three different thickness 2″, 3″ and 4″, it provides the necessary comfort with its high density foam. For extra comfort, this foldable mattress can also be used on top of your existing mattress. Furthermore, the washable knitted fabric cover allows a long usage of this good-to-have 3 fold mattress. For limited time only, all Sleepy Night mattresses come with free delivery, just select free delivery option during checkout. All our mattresses are authentic and from local distributors with standard warranty. At HomeGeeks, we strive to provide you with the best prices and quality with the goal to offer you the best online shopping experience with us! 2% Cash Rebate when you pay through Direct Bank Transfer. Refer to FAQ for more information. For limited time only, all Sleepy Night mattresses come with free delivery, just select free delivery option during checkout. All our mattresses are authentic and from local distributors with standard warranty. 2% Cash Rebate when you pay through Direct Bank Transfer. Refer to FAQ for more information. Features: Soft knitted fabric to minimize hot temperature, Washable knitted fabric, Orthopaedic support, extra firmness for back support, ISPA approved, Anti-dust mites, Anti-bacteria, Anti-fungi, Treated with RUDOLF.